The football community from across Malvern are coming together for a fun packed charity event on the evening of Friday 17th May 2019 in support of local boy Alfie Orton and to raise funds for Birmingham Children’s Hospital. Leigh and Bransford Badgers Football Club will be joined by Newton Sports and Welland Juniors at The Langland Stadium, Langland Avenue, Malvern where Malvern Town will play host to junior and adult fun matches with the combined focus on supporting seven year old Alfie Orton and his family whilst he remains under care at the hospital. In May 2017, Alfie then age five, was taken to A&E under the assumption he had sustained a concussion after complaining of serious headaches post a bump to his head. An MRI scan revealed that the actual cause of his discomfort was a brain tumour and less than 24 hours later, having been transferred to Birmingham Children’s Hospital, little Alfie underwent eight hours of brain surgery. Although the surgery was a success Alfie’s treatment is ongoing. Alfie would love to play football at the Badgers, just like his older brother Harley who is part of their u12 Saints squad, but this aspiration, one so easy for so many, is currently out of reach for him. 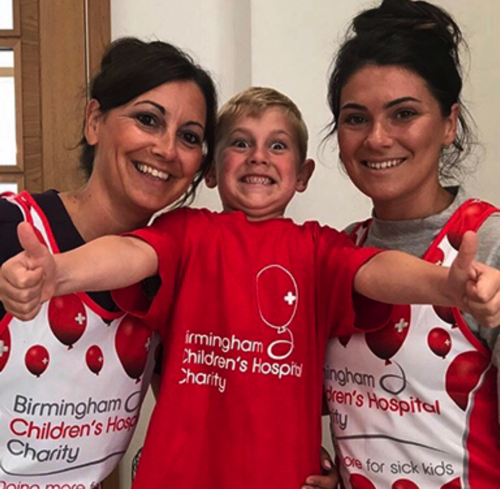 Alfie’s mum Roxanne and Grandmother Tracy also want to do their bit to raise funds for the hospital, so have decided to run the Simply Health Birmingham 10k Great Run on Sunday 26th May 2019. Whilst they have set themselves a target of raising £500, the four local football clubs have decided to put their collective fund raising weight behind the family and hope to smash their total with their charity evening on 17thMay. The clubs would love for as many people as possible to join them. The event, at Malvern Town Football Club starts at 6pm and a donation at the gate will enter all spectators into a draw from some amazing prizes. For those who are unable to make the event but would still like to show their support can contact the club to donate auction items or prizes, which will greatly help boost the events charitable target.